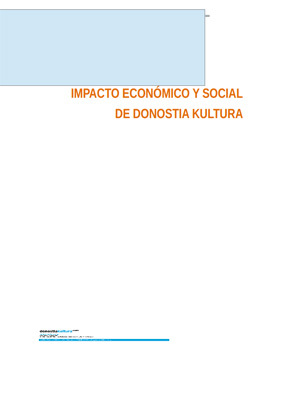 The document includes the main results of the study commissioned from Ikertalde to measure impact on the city and environment of Donostia Kultura, not solely focussed on the economic reach (although that too was included) but, above all, on the social and facilitating role it represents for the city. By way of a main conclusion, the study stresses that the activity carried out by Donostia Kultura constitutes an important economic engine for the city given the amount of budget it injects to the local fabric, the important number of jobs it generates, the different publics it mobilises, inducers of tertiary expenditure, the personal aspect, its free services and the connection to local cultural entrepreneurship and to the local creative industry fabric. By way of direct impacts, Donostia Kultura mobilises a budget of more than 25 million euros (75% of municipal contribution and 25% of own income).